Originally 2 columns, fragment contains 1 full column on each side plus approx 1/3 of another column. Written Area: 28 x 127mm. Column Width: 76mm. Number of Lines: 6. Line Height: 4mm. Column and line ruling in lead (?) Rubrication. Small Cursive. Date, place, and text identified by Bischoff in pencil note (now missing?) 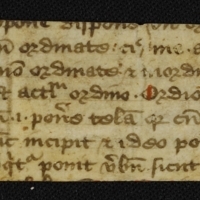 John Balbus' (d. 1298) Catholicon covering nouns beginning with the letter 'O'. One side contains ordior and the other opusculum. In a letter dated 6/6/1994 Colker wrote that he had compared the fragment to the reprint of the 1480 Mainz edition and found that explanations of words were similar and some of the text were similar but "there is much divergence" between the printed text and the fragment. He believed that the fragment came from an adaptation of the text printed in 1480; however, the Catholicon's popularity meant that it was often abridged and adapted. Have Rosenthal's notes ('Manuscripts from the Collection of Professor Bernhard Bischoff', p. 4 no. 11, based on Colker's notes). 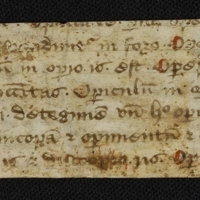 Physical size: 1 small vellum fragment (28 x 148mm). Appears to have been inserted into or possibly glued to pieces of paper at some point.